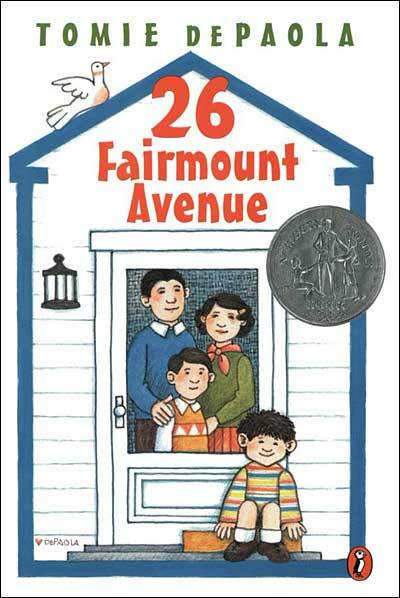 26 Fairmount Avenue is a series of ADORABLE early chapter books by the much loved children's book author and illustrator Tomie dePaola. His first chapter book ever, 26 Fairmount Avenue, was such a hit with fans and critics that dePaola followed it up with seven sequels... each one as absolutely delightful as the first! This is definitely not a book heavy on plot. Instead, it is a gentle story that provides a glimpse into little Tomie's childhood and into life in the late 1930s as seen from the eyes of an energetic little boy. 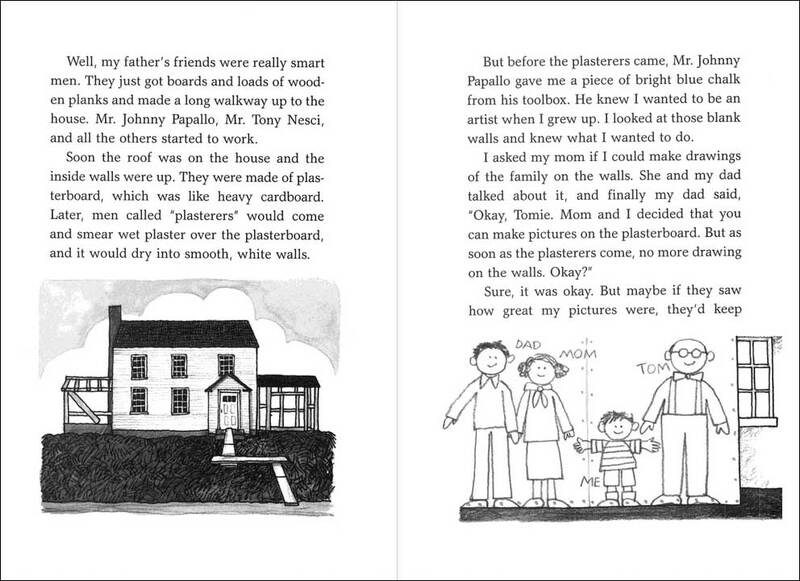 This title, and the entire series, tells the cute story of Tomie DePaola's childhood in the 1930s and 1940s. dePaola writes in an authentic, childlike voice and focuses on the details that a child of that age would notice. Once you read this book, like us, you will be excited to read the next in the series, and then the next one after that. There are eight books total, each as charming and endearing as the former. These books are quite short and could be read aloud to a class in under two weeks (if you read a chapter a day.) Then...you can launch right into the next one! And the reading levels are just right for kids to get hooked and starting picking this series up to read on their own as well. These books are chapter books, not a picture books. However, there are small black and white illustrations in virtually every spread, each one adding additional fun and information to the content of the text. 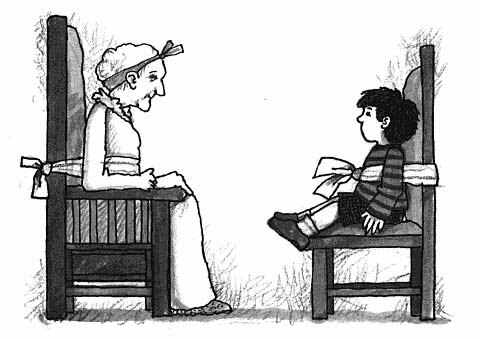 This illustration below is from the first title and depicts Tomie with Nana Upstairs, who is lovingly tied to her chair each day by Nana Downstairs so that she doesn't fall out. Tomie, who has a special relationship with Nana Upstairs, requests the same treatment when he visits, although his bow is tied in the front so he can easily get into and out of the chair. His relationship with his grandparents is adorable! 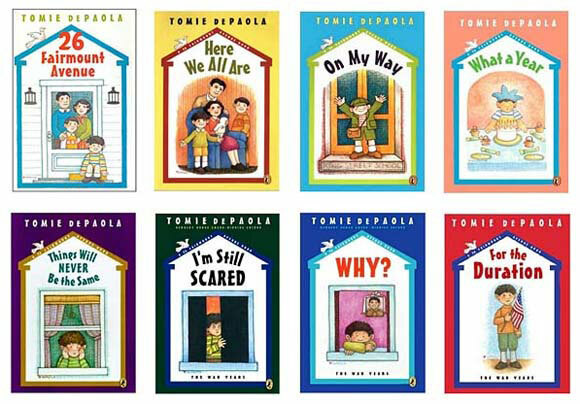 Tommie dePaola has put out a "comprehensive educator's guide" for his books (this series and many others that he has written and illustrated). We love his books so this lesson / activity packet is a goldmine!! :) Just click on the link to access this FREE resource yourself. And, there are A LOT of lesson / activity packs available on Teachers Pay Teachers. We haven't personally used them with our classes, but some have a lot of positive reviews. To see these 26 Fairmount Avenue lesson / activity ideas, click the link or the pictures below.